The aim of Evolutionary Robotics is to develop neural systems for behavior control of autonomous robots. For non-trivial behaviors or non-trivial machines the implementation effort for suitably specialized simulators and evolution environments is often very high. The Neurodynamics and Evolutionary Robotics Development Kit (NERD), presented in this article, is a free open-source framework to rapidly implement such applications. 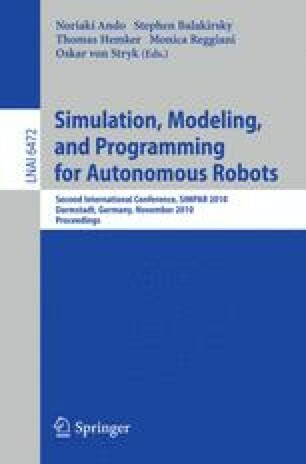 It includes separate libraries (1) for the simulation of arbitrary robots in dynamic environments, allowing the exchange of underlying physics engines, (2) the simulation, manipulation and analysis of recurrent neural networks for behavior control, and (3) an extensible evolution framework with a number of neuro-evolution algorithms. NERD comes with a set of applications that can be used directly for many evolutionary robotics experiments. Simulation scenarios and specific extensions can be defined via XML, scripts and custom plug-ins. The NERD kit is available at nerd.x-bot.org under the GPL license.